This traditional four bedroom semi detached property has been extended to create open plan living at its best on the ground floor and the extra bedroom which the accommodation demands! Set within a large plot with gardens over 95ft to the rear, it is the perfect family home. The accommodation compromises; porch, entrance hall, WC, living room, open plan lounge/kitchen with velux windows & patio doors to the conservatory. To the first floor are three double bedrooms, a further single bedroom & bathroom. Off road parking is provided to the front, a driveway leads to a detached garage. To the rear is a patio area & large gardens laid to lawn. Solar Panels come included. Located within easy reach of Sale Town Centre & Sale Moor Village, with great transport links to Metrolink and motorway networks, it will be popular so call now to book your viewing. UPVC front door. Windows to front and side aspects. Ceramic tiled flooring. Door leading through to main house. Stairs rising to first floor. Double radiator. Laminate flooring. Ceiling light point. Wall mounted security alarm panel. Opaque window to front aspect. Low level WC. Wash basin with storage underneath. Partially tiled walls. Ceramic tiled flooring. Opaque window to side aspect. Extractor fan. Ceiling spotlights. Good sized reception room with flexibility of uses with bay window to front aspect. Laminate flooring. Picture rail. Radiator. Ceiling light point. Fantastic open plan space. Kitchen with low level storage units with additional eye level storage. Built in electric oven/grill. Four ring gas hob with extractor hood and lighting over. Partially tiled walls. Recess for American style fridge freezer. Recess and plumbing for dishwasher. Central island units with additional base level storage units and roll edge work surfaces over. Recess and plumbing for washing machine. One and a half bowl sink with single drainer and mixer tap over. Double french doors opening out onto a conservatory. Further windows to rear aspect. Incorporated dining area with velux windows providing ample natural light. Ceiling spotlights. Archway leading through to lounge area. further ceiling spotlights. Double radiator. A great addition to the home providing further flexible reception room space. Windows to rear aspect. Patio doors leading out onto driveway and gardens. Tiled floor. Double radiator. Opaque window to side aspect. Loft access. Doors leading to all rooms. Ceiling spotlights. Fantastic sized double bedroom with bay window to front aspect. Laminate flooring. Picture rail. Ceiling light point. Further double bedroom with window to rear aspect overlooking gardens. Laminate flooring. Ceiling spotlights. A further double bedroom with opaque window to side aspect. Window to rear aspect. Laminate flooring. Double radiator. Ceiling spotlight. Useful single bedroom currently being used as an office with window to front aspect. Laminate flooring. Double radiator. Ceiling light point. Modern suite comprising of low level WC. Wash basin with storage below. Large walk-in shower cubicle. Chrome heated towel rail. Opaque window to side aspect. Ceramic tiled flooring. Partially tiled walls. Extractor fan. To the front of the property there is a brick block paved driveway providing off road parking for 2/3 cars. Low level brick wall enclosure. Wrought iron gates leading to driveway. To the rear of the property there is an initial flagged patio area leading to detached garage with double doors. Large gardens mainly laid to lawn. Wooden fence panels enclosing. Mature flowering and shrubbery boarders. 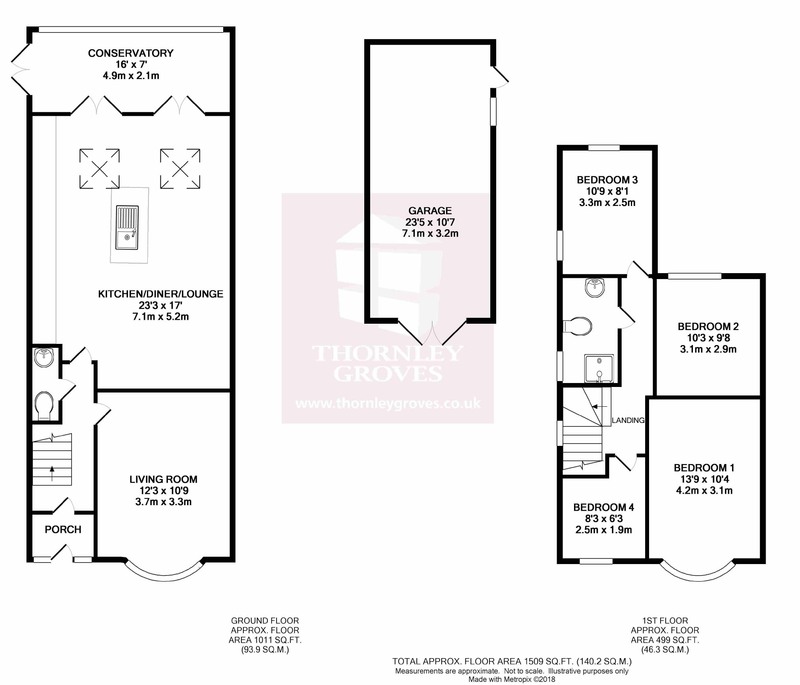 This property is freehold and is in the Trafford Borough, Council tax - Band D (£1,484.89 pa). From Sale centre proceed along Northenden Road in a south easterly direction and proceed through Sale Moor village along the one way system and bear right off Old Hall Road heading back along Northenden Road back towards Sale. Take the second left onto Conway Road where the property can be found after a short distance on the right hand side.